Book this place! I can't put it any more simply than that. The location -- off noisy, traffic-ridden Kihei Road, on a quiet side street with ocean frontage -- is fabulous. A grassy lawn rolls about 50 feet down to the beach, where there's great snorkeling just offshore and a popular surfing spot next door; shopping and restaurants are all within walking distance. 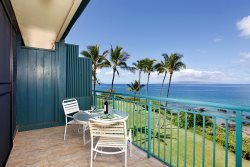 All of the beautifully decorated units in this small four-story building have fully equipped kitchens and lanai with great ocean views. Rooms go quickly in winter, so reserve early. Our family had a wonderful stay at Punahoa this year, and we are looking forward to staying there next year as well. The condo is beautiful with a location that is better than any place we have ever stayed on Maui, and we have been coming to Maui for 30 years! Annie does a wonderful job cleaning and you are a terrific and attentive manager. There is nothing that can be improved! Mahalo, and we look forward to seeing you next year. Susan and George B. The condo was well equipped for a stay in Maui with a great view and location. Additionally, Zaldy was a fast communicator with accurate instructions for check in after office hours. - A.J. This is a lovely place, with a gorgeous view of the ocean. You can see surfers and sea turtles in the nearby beach. Zaldy is a great host, the apt was very clean and packed with very practical kitchen utensils and other amenities. We will visit again! This place was amazing!!! The view is incredible and it is so cozy! There is no AC, but the ocean breeze is more than enough! Incredible place! We had an amazing time staying at this beautiful place! It fit 2 people perfectly. The pictures don't even compare to the spectacular view in person! Would definitely return! A wonderful stay - beautiful location just as described. No need to travel to do snorkeling and sea turtle viewing - they are 20 feet from your back door. Great place! Great view. Hard to leave. The VIEW was amazing! Normally I stay at hotels and would never be able to afford such ocean front scenery and ambiance otherwise. The place was plenty spacious enough and well equipped with what we needed. The main room is the highlight and a great place to enjoy the view and spend time with your travel mates. If you're a millennial or retired engineer who needs a mommy to do your laundry and rub your feet, this probably isn't the place for you. We would politely suggest that you check into a snarky, overpriced hotel instead. However, if you're an adult and want a fabulous base from which to operate, with a romantic view and among the best weather in Maui, this is the place for you. We couldn't be happier with the proximity to great beaches and the helpful staff. The property has the typical character and charm of older condos in Hawaii and was perfect for us. Great location with amazing view. The studio condo is well equipped but is quite small -- enough space for one person, cozy for two. Despite its small size, has everything you need and is well set up. The location is excellent and there is great snorkelling right in front of the condo. Everything you need is within walking distance. Excellent! This condo exceeded my expectations. The view of the ocean is incredible. (In my opinion - ocean views are so important to this type of vacation. Being able to see the ocean while relaxing in the condo... watching stand-up paddleboarders, surfers, snorkelers... is so relaxing. You can also see the sunset over the ocean from the condo). The condo is close proximity (a few blocks) from great restaurants, shopping, nightlife in Kihei. Thanks! Was an amazing trip! Room had all the stuff you need for the beach: towels and chairs loved the place would recommend for anyone who wants to relax and have a good time as a couple or if your by yourself! This tasteful boutique condo, hidden on a side street, fronts a quiet beach frequented by sea turtles. Who needs a pool? All apartments have ocean lanai; penthouses get air-con. The only place we stay on Maui We keep coming back to the Punahoa. We've stayed here 5 times over the past 10 years, and we're coming back for a 6th this summer. These views, at these rates, are unbeatable. Most units have everything you could possibly need for a great Maui vacation -- beach towels, beach chairs, beach umbrellas, coolers, ice packs - and management has beach toys for the kids if you ask. I love having a full kitchen on vacation -- no need to spend hundreds every night on dinner, just grab some fresh fish and make your own sunset dinner for pennies on the dollar. Can't wait for my next visit! We didn't want to leave! The location was great. 50 steps to your own private beach; snorkeling and turtles and if you wanted more company, then a one block walk was all it was to Charley Young Beach. A short 2 Block walk and you were at some outdoor markets and shops. Very well located. The unit was very clean and had everything you needed to prepare your meals. We had no problem with bugs or other critters in our unit. The managers were very easy to deal with and we felt that they were sincerely interested in making sure our stay there was enjoyable. We are definitely planning on another trip to Maui and we would definitely be staying here again. The sunsets were awesome and watching the surfers from your balcaony while drinking your morning coffee was a great way to start your day. This is a great place Punahoa is low key, quiet, and right on the water. Good swimming and snorkeling right in front. No pool but who needs it. Well maintained, clean and inexpensive. Breathtaking Views 280 Degrees This was one the best vacations ever. The Punahoa is very private and quiet plus it is very close to shops, Charley Young Beach and Cove Beach. The surfing is great for beginners right on your front yard beach. We stayed in the penthouse (401) and loved the additional roof garden for evening star gazing. Comfortable, clean and friendly atmosphere right on the water. You couldn't get any closer without a bathing suit. Longer term guests get a discount...stay for couple weeks. High speed coming soon!